At first glance, the remote villages of the Kabre people of northern Togo appear to have all the trappings of a classic "out of the way" African culture—subsistence farming, straw-roofed houses, and rituals to the spirits and ancestors. 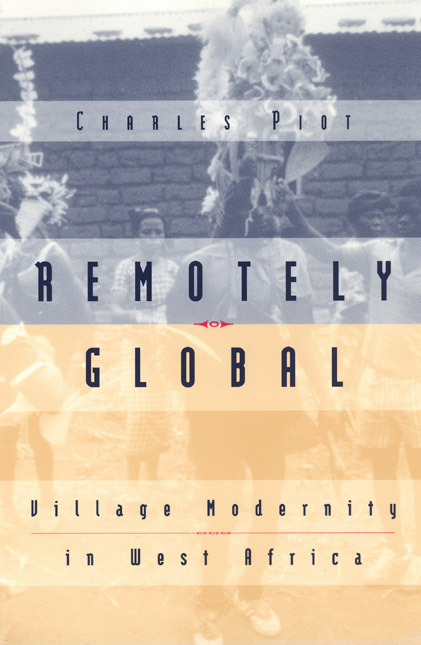 Arguing that village life is in fact an effect of the modern and the global, Charles Piot suggests that Kabre culture is shaped as much by colonial and postcolonial history as by anything "indigenous" or local. Through analyses of everyday and ceremonial social practices, Piot illustrates the intertwining of modernity with tradition and of the local with the national and global. In a striking example of the appropriation of tradition by the state, Togo’s Kabre president regularly flies to the region in his helicopter to witness male initiation ceremonies. Confounding both anthropological theorizations and the State Department’s stereotyped images of African village life, Remotely Global aims to rethink Euroamerican theories that fail to come to terms with the fluidity of everyday relations in a society where persons and things are forever in motion.